2013 Dresses | yves saint laurent touche eclat | Steal This Dress! 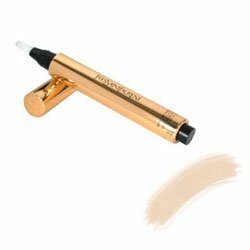 Allow me to introduce you to my new “magic wand,” YSL’s Touch Eclat or Radiant Touch Highlighter to those of us do not parlent francais. It’s marketed primarily as a highlighter, but boasts concealer powers as well. I suffer from horrendous dark circles no matter how rested I am and so for me, a good concealer is key. Touch Eclat features an brush applicator tip that you use to paint drops or streaks on the product onto your skin. It has a really fabulous texture that you can keep working and spreading around without it becoming cakey and muddy. In terms of masking circles and other imperfections, Touch Eclat gets 5 stars. But that’s not to say that its highlighting capabilities are not noteworthy. Apply it to your t-zone and boom! Radiant, glowing skin is yours.